Dao Mau and “Len dong” have been recognised as an Intangible Cultural Heritage of Humanity. “Len dong”, otherwise known as ‘hau dong’ or ‘hau bong’ (‘to mount the medium’ or ‘to go into a trance’), is a ritual in which practitioners become mediums for various deities who take over their bodies and carry out actions in the human world. The practice, also referred to as the ‘shaman dance’, is indigenous to the Vietnamese folk religion called Dao Mau, or the worship of mother goddesses. During the main ritual, which may last up to seven hours, the len dong practitioner incarnates a series of different deities and spirits, changing into a different set of costumes for each incarnation. Once the deity has taken over the practitioner’s body, they may perform a dance or attempt several dangerous stunts such as walking on embers or piercing a metal rod through the medium’s cheeks. The process is normally aided by musicians and singers of ‘chau van’, or invocation singing, who will perform invocation songs to induce a trance in the practitioner, preparing them for incarnation. A len dong practitioner may incarnate several deities in one session, with the accompanying chau van music changing depending on which deity is being incarnated. When the dance is finished, the audience is able to approach the still-possessed practitioner to make offerings, petition the deity for favors, or to have their fortune told. Len dong was banned by the Vietnamese government, who deemed the practice superstitious, until 1987 following a relaxation of restrictions on the practice. Len dong has since attracted increasing attention from scholars as a nuance of Vietnamese culture and regained popularity as a performance ritual. Several festivals have been held in recent years to honour the practice and its associated religion of Dao Mau, while delegations of len dong practitioners have travelled abroad to perform. Since 2012, the Vietnam Ministry of Culture, Sports and Tourism has honored chau van singing as part of the national intangible cultural heritage. In 2013, the Ministry filed the practice of Dao Mau and len dong to the United Nations Educational, Scientific and Cultural Organization (UNESCO) to be recognized in the organization’s Representative List of the Intangible Cultural Heritage of Humanity. On 1 Dec 2016, Dao Mau and “Len dong” were recognised as Intangible Cultural Heritage of Humanity. 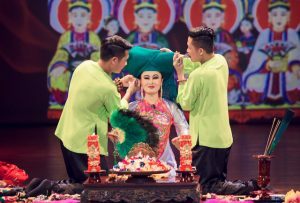 To bring the worship of Mother Goddesses close to the public, to retain the beauty of Vietnam’s cultural heritage and introduce it to global audience, Viet Theatre produces a series of hau dong performances. There are two shows each Tuesday, Thursday and Saturday at Cong Nhan Theatre, 42 Trang Tien Street, Ha Noi. Every six months, the content of the programme will be changed so that the audience can enjoy the entire 36 sessions of the full trial.